If you haven't flown JetBlue yet, you're missing out. It's a young airline (started in 1999) that has the best of full-service carriers, like United, Delta, and American, and low-cost carriers like Southwest. JetBlue is generous with its flight perks - solid in-flight snacks, free in-flight Wi-Fi, and televisions with tons of options at every seat. That, combined with its super competitive prices, makes it worth checking out anytime you are booking a flight. 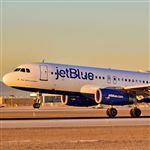 JetBlue's TrueBlue rewards programs offers members lots of opportunities to earn points. Your next step is to use them for great flights. 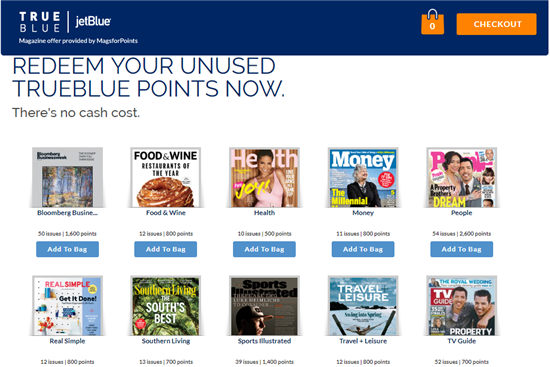 Keep reading to see some of the best ways to redeem your TrueBlue points. One of the biggest benefits of TrueBlue points is that they can be used to book any flight at any time. No blackout dates. No seat restrictions. No close-in booking fee. JetBlue (like Southwest and Delta) has a revenue-based program, meaning the amount of points required for a flight is based on its cost. This is different from United and American, which have zone-based systems where the amount of points for each flight is based on where you are going. Mint: The premium option with lie-back seats, dining options, early boarding, etc. As you move up the fare ladder, the number of points required also increases. 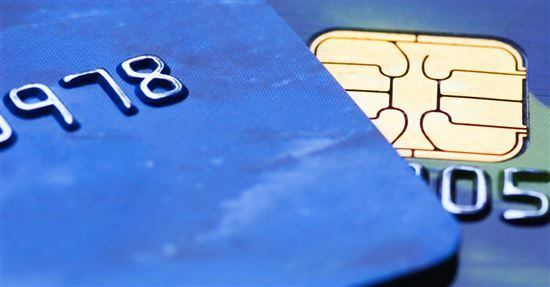 Read on for how to get the most out of your TrueBlue points. Don't have enough points? JetBlue has a cool feature called Points Pooling. This allows you and 6 of your closest friends/family members to collect all your points into one big pool. You'll nominate a "Pool Leader" who administers points and approves who can buy flights. 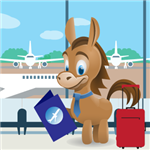 This significantly increases the amount of points you can use for flights, so don't miss out if you know people who are willing to team up with you. The key to finding the best deals with TrueBlue points is to search early and often. Because the points required for flights are based on their dollar price, the earlier, the better. And pay attention to those JetBlue sales. The process for searching for flights is simple. You should already have a JetBlue account at this point, but if you don't, make sure to sign up for one on their website. After that, you'll just go to JetBlue's site, input where and when you want to travel, and then check the box that says "Use TrueBlue Points." You'll pay for the taxes and fees, and the cost of the flight will come out of your JetBlue TrueBlue miles. It's as simple as that. If you don't have enough points, no worries, we can help you get there. For domestic flights, you will only pay a $5.60 Security Fee in each direction. 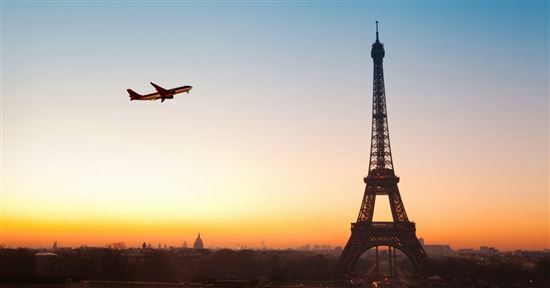 International flights cost a little bit more in taxes and fees. What if the price drops? If you buy a flight through JetBlue and then the price drops, they will credit you the difference. In order to take advantage of this, you have to call them and tell them the price dropped. They won't automatically do it for you. If the price drops and you call within 5 days, there is no fee for changing it. If you're calling 6 days or more after buying the flight, you'll pay a $75 change fee (for Mosaic members, you can just cancel the flight and rebook at the cheaper rate for free). They'll do this for flights purchased with cash or points. Let's get down to business. We've thrown in some tips and tricks to help you max out your TrueBlue points. We have some examples below to show how many points are needed for certain flights. However, all of these options are subject to change. Based on our estimates, TrueBlue points average between 1.5 and 1.8 cents apiece. Any deal where your points are worth less than that isn't worth it. To figure out the redemption rate of a flight, take the cash value of the flight and divide it by the number of points required. Let's say a flight costs $74 or 4,400 points. You would calculate: $74 ÷ 4,400 = 1.68 cents. This means each point is worth 1.68 cents. That's a good rate. Keep reading for the best ways to use your TrueBlue points. If your travel dates are flexible, use JetBlue's "Best Fare Finder" (found under the "Book" tab on the top menu bar). This pulls up a calendar that automatically gives you the lowest fares on each day of the month. To see the lowest fare in points, select "TrueBlue points" before you click "Search." You can then move through the calendar to see which day has the least number of points for the flight. JetBlue has seasonal flights from Seattle to Alaska during the summer months. If you find yourself wanting to take in the beautiful panoramas of the Alaskan wilderness, you can fly from Seattle to Anchorage for 11,000 TrueBlue points round trip. This comes out to 1.7 cents per point. Remember, these flights only run seasonally, so make sure that you're planning in advance and not trying to book a Christmas trip three weeks in advance. Once the Obama administration and Cuba came to an agreement to open the country to US travel in 2014, airlines were quick to apply to hop in the game. 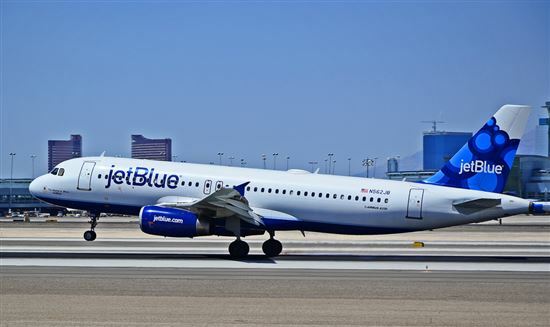 JetBlue is one of the airlines that was approved to fly to Cuba. You can fly to Cuba from Orlando, Fort Lauderdale, JFK, and Boston, all for as few as 4,800 points each way. Side note: you can fly to Havana from all four US cities we listed, but only Fort Lauderdale will connect you directly with Santa Clara, Camagüey, and Holguin. If you're in other parts of the U.S., you can find flights to Cuba for as low as 7,000 points each way. You'll just have to connect in Florida. JetBlue has flights all throughout the Caribbean. Feel like heading to Jamaica or Aruba? They've got you covered. Some of those flights also offer Mint seats, so you can really fly in comfort. If you're looking for your cheapest option, you can fly to a number of Caribbean destinations, like Cancun, Kingston, or Barbados, for as little as 10,000 points round trip. That calculates out to 1.9 cents per point. In comparison, American and United Airlines would require 25,000-35,000 miles for a round trip to the Caribbean. Getting anywhere south of the United States on JetBlue is much cheaper if you're flying out of Orlando or Fort Lauderdale. If you're committed to using your TrueBlue points, but can't find a cheap flight from your home airport, consider taking a positioning flight. That's a really cheap flight to get you from your city to a major airport hub like Fort Lauderdale. Arrive the day before in order to be able to fly JetBlue out of one of these two airports. There aren't a ton of budget airlines that fly to South America, but JetBlue is one of them. They'll take you to Colombia, Ecuador, or Peru for a steal of a deal, if you time it right. 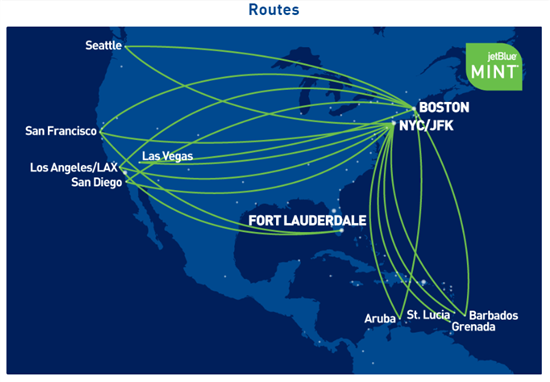 You can fly to all of their South American cities directly from their hub airport in Ft. Lauderdale, and they have connecting flights from all over the country. 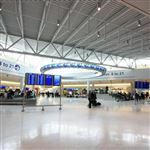 You can find round-trip flights from Florida for under 11,000 points, which calculates to a whopping 2.1 cents per point. If you're flying from other parts of the country, you can find fares for as low as 22,000 points round trip. If you're feeling adventurous or you're willing to wait for a steal, check out JetBlue's "Flight Deals" section under the "Explore" tab on their website. They have a section for cash deals, but underneath that you'll find specials for TrueBlue points users. Make sure to cross-check how much your points are worth, however. Not all sales are created equal and sometimes you'll be redeeming points for 0.9 to 1.3 cents per point - not a great option. Mint, JetBlue's First Class option, will have you flying cross-country while lounging on your lie-back seat and sipping a free glass of wine. For a domestic flight, Mint offers very cozy lie-flat seats and amazing food options, including locally-sourced ice cream, tapas, and a full cocktail menu. Mint routes are mostly concentrated in major cities, so check out JetBlue's Mint page in order to see if you can catch a Mint flight to your destination. Redemptions are not always the greatest with Mint. The lowest we found for a one-way flight between New York (JFK) and Los Angeles (LAX) was 58,000, with a redemption value of 1.3 cents per point. This isn't in the 1.5-1.8 cents per point range we mentioned above, but trust us, it's worth it if you want to treat yourself. 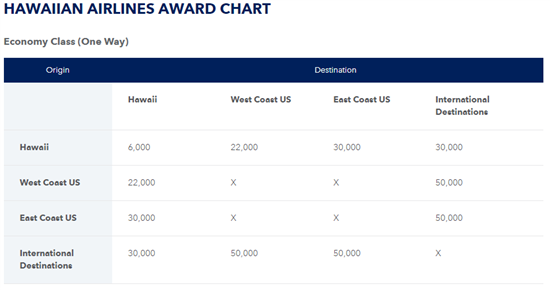 Hawaiian Airlines is JetBlue's only partner that allows you to redeem TrueBlue points for flights. 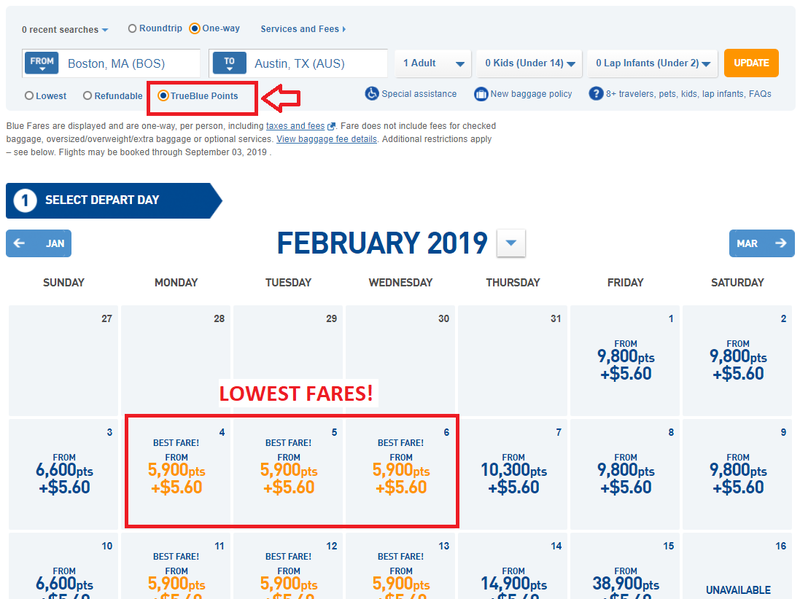 In this case, JetBlue doesn't use its revenue system - it just has a set, zone-based chart for how many points it will cost you to go from point A to point B. This means that redemption values can be all over the place, ranging from 1.1 cents per point to 2.1 cents per point. 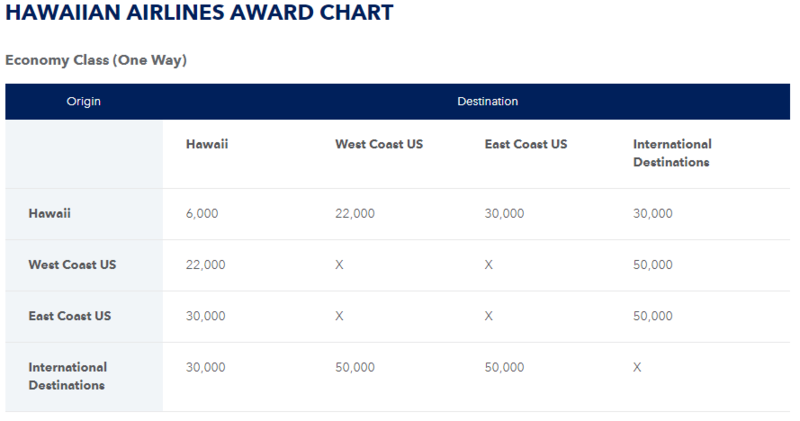 Flying to Hawaii using 44,000 points round trip from the West Coast or 60,000 points from the East Coast could be great deals, especially if it's during peak season when a round-trip flight could be $1,000+. Do a little cross-checking to see if this option is worth your while, but it is a unique way to use those TrueBlue points to travel outside of the JetBlue network. If you're interested in a vacation that doesn't take a lot of planning, JetBlue has offers for flights + hotel deals. You will pay with a combination of cash and points. Unfortunately, there is no way to only pay with points. For example, you can travel from Chicago to New York for an 8-night vacation and pay 18,600 points + $840 for two people. That's 1.71 cents per point. Another example has you flying from Boston to Aruba in February (to escape that winter weather) for 8 nights. A four-star hotel + flights will cost you $2,011 + 46,400 points, giving you a value of 1.5 cents per point. Take the time to do a little exploring in the JetBlue Vacations tab the next time you're looking to take a trip. If you're looking to really max out the value of points at a hotel, however, consider using a hotel credit card. Max out your rewards. Booking a vacation package with JetBlue? 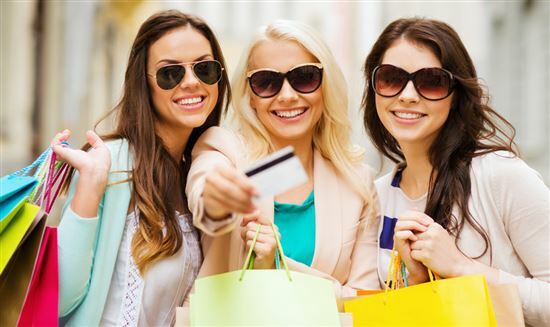 Be sure to use a credit card that will offer you more points for booking travel, like the JetBlue credit cards, Chase Sapphire Preferred, or Capital One Venture. This one is an exclusive perk for the JetBlue Mosaic members. You can use your points to upgrade your seat to an Even More Space (EMS) seat at fantastic value. Instead of a mere 30-32 inches of legroom, you'll enjoy 38 inches. Reportedly some passengers have even been able to walk from the window seat to the aisle without disturbing the other people in their row. Usually, upgrading to an EMS seat costs between $10 and $90, depending on how long the flight is. Mosaic members can upgrade with 200-1,000 points. This means that the points value is a whopping 5-9 cents apiece. That's a great use of your points if you feel like stretching your legs. Even More Space seats also get you expedited check-in and boarding. Other extra benefits of being a Mosaic member include no cancellation or change fees and two free checked bags. Got points to spare? 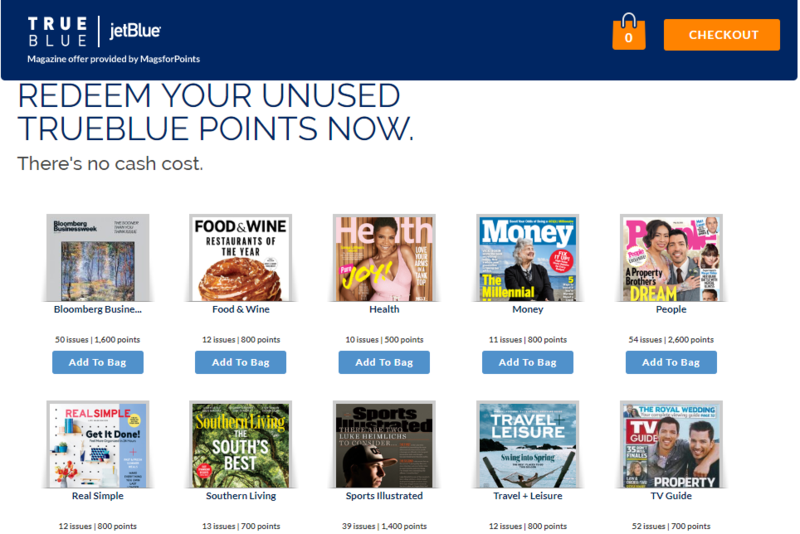 If you are into that print media lifestyle, you can use TrueBlue points for magazine and newspaper subscriptions. There is a pretty impressive selection of magazines, and you'll get them for prices ranging from 400-1,900 points depending on the publication. That's 1.5-1.8 cents per point, which is a decent redemption. JetBlue is stepping up to the charity plate with its points donation option. You can donate some of your TrueBlue points to a wide range of charities like the Make-A-Wish Foundation or Ronald McDonald House. The charities can then use those points to book their own travel. There aren't any fees associated with the transfer. Just choose which charity you want to donate to and how much to give. You can donate in intervals of 1,000 points. 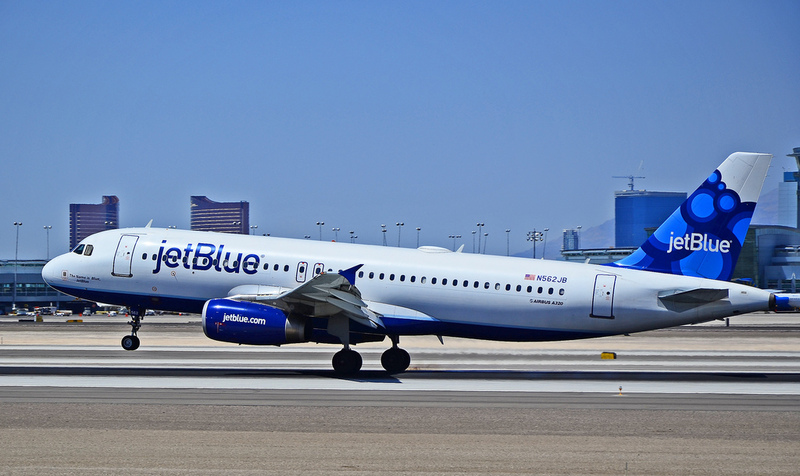 JetBlue is quickly becoming a force in the airlines world. It offers a great balance of premium perks and budget prices. Their TrueBlue points program can get you some great flight deals, so definitely check them out the next time you're booking award travel. 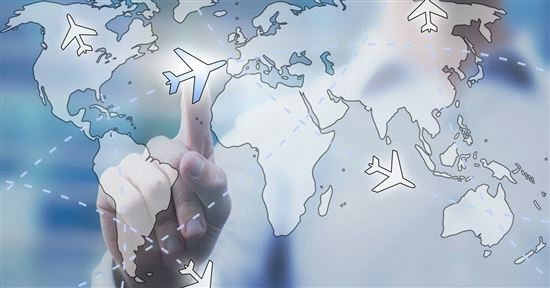 Remember the golden rule here: the earlier and more often you look for flights, the better. Leave a comment about Redeem JetBlue Points?